Easter – this year on April 21st – is just around the corner! 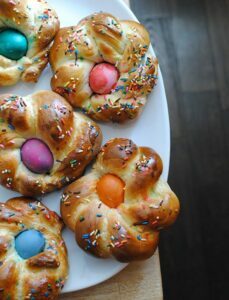 No Italian Easter is complete without Pane di Pasqua (Easter Bread) made in the form of baskets! Our favorite Italian nonna, Gisa Ferro who is originally from Calabria, shares her special recipe for this Easter tradition. Let us know how it is if you make it! 1.In a bowl combine flour, baking powder and salt. Set aside. 2.In a bowl with mixer on high speed, mix butter, eggs, sugar, oil and vanilla extract. Reduce speed to Low and gradually add flour mixture and 1/2 cup of milk until thoroughly combined. 3. Lightly sprinkle work surface with flour. Divide dough into three equal pieces. Cover with a clean kitchen cloth and let rise, about 1½ hours. 4. Preheat oven to 375 degrees. Divide dough into 8 portions. 5. Cut in two 4 ” logs and braid in a spiral to make baskets leaving a small opening in the middle for the egg. 6. Place baskets on a greased cookie sheet. Brush baskets with egg wash. Sprinkle with confetti sprinkles. Place colored eggs in the center of the baskets. 7. Bake for 25-30 minutes until golden brown.